We’d love your help. 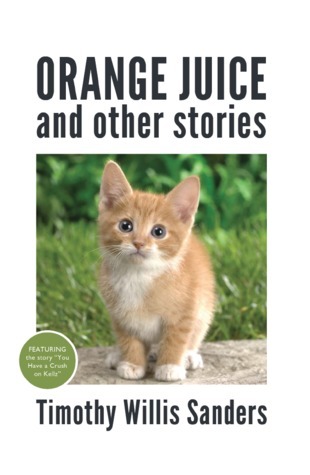 Let us know what’s wrong with this preview of Orange Juice and Other Stories by Timothy Willis Sanders. Nine short stories and very short stories about what it's like. To ask other readers questions about Orange Juice and Other Stories, please sign up. short, quick stories that are so simply stated to make them cinematic in the way that a cassavetes film slows down reality and allows its characters to live each and every moment in full public view. the emotions seem both strong and weak, which is what makes them so powerful. i liked this book a lot. It’s always slightly uncomfortable when a friend introduces you to his or her ‘creative work,’ something that occurs quite frequently when you’re living in Austin, Texas. I have my own fair share of ‘creative’ friends, and although I’m often genuinely impressed by their creations, over the years I find myself hoping a bit too often that my (often harsh, judgmental) opinion of the friend’s particular work won’t prevent me from saying ‘oh, that’s…awesome’ without at least a scrap of honesty. I have It’s always slightly uncomfortable when a friend introduces you to his or her ‘creative work,’ something that occurs quite frequently when you’re living in Austin, Texas. I have my own fair share of ‘creative’ friends, and although I’m often genuinely impressed by their creations, over the years I find myself hoping a bit too often that my (often harsh, judgmental) opinion of the friend’s particular work won’t prevent me from saying ‘oh, that’s…awesome’ without at least a scrap of honesty. I have to admit, however, that when my good friend Timothy Willis Sanders announced that a collection of short stories he had written was going to be published, I didn’t feel the usual uncomfortable uncertainty. I was somewhat familiar with Sanders’ writing already- in addition to regularly perusing his blog, I had read two of his short stories before. Each time Sanders had shared any of his work with me, he had prefaced it with some version of, “I’m not sure if you will like it, it might be inconsistent with your taste.” While I appreciated his concern, this was not only incorrect (I happened to ‘like’ his modern, stripped down, and fun style of writing very much), but it also missed the point- that his writing, regardless of the (too often fickle) taste of the reader, is just plain and simply good. After reading (and rereading and rerereading) the newly published Orange Juice and other stories, I can happily say that my initial confidence was right on. In a nutshell, Orange Juice is absolutely wonderful, and I would without a doubt recommend it to anyone who likes to read solid, well-crafted fiction. You can almost see the sweat and blood beneath each carefully chosen word and meticulously carved sentence, but on the surface, each of the stories reads as smoothly and effortlessly as melted butter. The book is short- it can easily be read in its entirety in one sitting. The richness, however, comes from the fact that the volume can then also easily be read over and over again, with each rereading yielding ever more satisfactory results. Rereading reveals the fact that Sanders has crafted the stories so beautifully that seemingly simple sentences are in actuality much more meaningful (and often more dark) than the reader understood in the beginning. The first story, the titular story of the collection, is a great example of this. Only two pages long, the story quite simply describes the events that take place before and after a trip to the grocery store by Jeanie, a mother with an unidentified illness, and her son, Chris, under the stern (yet caring) guidance of Jeanie’s husband, Bill. Initially, the reader is drawn into the comedy of the story, particularly by Chris’s interactions with his video game and the descriptions of drafting the grocery list, but the story becomes darker as it progresses. All the “action” in the story is described so simply, it’s not even clear that anything of particular importance is taking place. A perfect example, the last paragraph includes this sequence of events- “Bill drinks the orange juice. Bill sets the glass on the counter. Chris swipes at the glass. The glass spins through the room and lands on the couch.” These sentences carry no judgment, no description of emotion, and yet, within the context of the story, they perfectly encapsulate the emotional tension and turmoil of the characters. As a big fan of Iranian cinema, this writing style particularly appeals to me. In the best of Iranian movies, hardly anything actually takes place. The camera simply follows characters through moments of life, through conversations, through simple glances and tasks. It may appear that nothing of importance has happened, but these quiet moments encapsulate all the power of life. It would be difficult to discuss specific stories in the collection at any length without giving too much away. Two stories especially stood out from the rest however, and are particularly worthy of mention. They also happen to be two of the longest stories in the collection. The first, “Sweet Potatoes”, can sort of be described as a “family drama”. In the story, the narrator leads the reader on a journey from Austin to Waco, but the real destination is a long deliberated (and ultimately anticlimactic, but emotionally stirring) call to his mother in Oklahoma. Sanders wonderfully captures the loneliness of the main character, of his feelings as an ‘outsider’ and his sense of loss of ‘family’. The second, “Driver’s License” follows a lonely narrator through the brief lead-up to and aftermath of a night with another man’s girlfriend (a particularly funny sequence in the story involves the narrator’s ignorance of the word ‘id’ and a possible mix-up of the word with the abbreviation for identification). This story is a wonderful study on the loneliness in the age of technology, where everyone is incredibly connected virtually, yet so disconnected in actuality. Both these stories contain more drama than the other stories, yet they don’t stray from the overall tone of underlying subtle complexity consistent throughout the collection. They are also incredibly relatable. One of Sanders biggest strengths comes from the fact that he allows enough ambiguity as to allow the reader to add his or her own coloring to the stories. All this is to say- you should read Orange Juice and other stories. Who knows what the future will bring for Tim Sanders, but I sure do hope it involves more writing. Many other reviewers have said that they hope for longer works in the future- I would like to second this notion as well. But, the short short stories are also so enjoyable that another collection of such well-crafted gems would be equally desirable. Either way, I know I will be eagerly awaiting more from Tim Sanders, and from what I have seen in this collection, know that I won’t be disappointed when more does arrive. Form following function, function following form. An uncomortable stuntedness in length, character, feeling. Amidst that stuntedness the stories are hard to like, exactly, though enjoyment in that sense is perhaps beside the point, that point being discomfort. They are good stories and well done. A selection of very short stories - perhaps just a few 100 words each. The author has an uncanny ability to vividly bring characters and situations alive using a very few carefully chosen words. Recommended. Yes! Sanders has honed in on a simple style, with much to read between the lines. Story after story, you realize just how much he has perfected his voice. Modern, humorous, and easy to read - but not for a lack of seasoned emotional content. Just wait for it. These are really enriching stories that unfold the more I read and think about them. My favorite is "Driver's License," but my favorites change quickly and all the stories are great. "I want Marcel to tell me if there are heads at the bottom of the river." A bold, fresh voice! I highly recommend these well crafted, entertaining stories.